Eartham Distributors' business epitomizes the concept of filling of an immediate need, arising out of ever changing government environmental regulations. Eartham meets this need by utilizing the latest technology available in the painting and coating industry. The market analysis provided in this plan, shows how a company with a basic product base, can infiltrate numerous market segments. Eartham Distributors, hereafter called "The Company", is a new company formed to exploit the burgeoning environmental market for safe paints, coatings and cleaners. The Company will exploit contracts and initial sales of its founders in environmental coatings representation and distribution. The new company will be incorporated in Maryland as a Sub-Chapter "S" corporation. The Company is a manufacturer's representative and distributor for Cather Inc., a Nebraska corporation, and the former employer of The Company's principals. The Company's Cather products are high quality, environmentally safe coatings, and cleaners, and are targeted for Original Equipment Manufacturers (OEMs), industrial painting contractors and governmental use, intended to satisfy the needs of the legislatively driven coatings industry. The Company's products are recognized nationally by government and industry as technically leading environmental products. U.S. industry is being forced to comply to new regulations by EPA and state regulatory agencies for air quality and toxic substances that is creating an extremely heavy demand for environmentally safe products such as those offered by The Company. The Company's principals are exercising the option in their OEM representation contract to open a wholesale distributorship for Cather products to service small manufacturers, service contractors and government purchasers, and can additionally sell franchises to authorized dealers. The Company will distribute in Delaware, Massachusetts, and Rhode Island. The Company intends to rapidly exercise options for Maryland and Virginia, already having significant pending sales in Virginia. The Company's main objective in distribution is to provide a rapid and dependable response for small quantity custom colors for small manufacturers, state and municipal governments and industrial contractors. This service commands approximately 20% mark-up over prices charged OEM users of approximately 200 gallons or more. The distributor may also service large OEM's by providing buffer and emergency stock in conjunction with the manufacturer's contract. The Company's current representative business will continue to service large OEM manufacturers for a commission of approximately 10%. These commissions will also be earned on distribution volume above the normal distributor markup providing significant growth capital for distributorship outlets. The Company plans to immediately open a distributorship in Petersburg, Virginia, to supply the Northern Virginia areas. Expansion is then planned for two additional locations, one between New York and Rhode Island and the other in Dover, Delaware in the first year of operations. Additional locations in Rhode Island, Bethesda, Macon, Augusta, Roanoke and other cities are planned for the second year. The Company's supplier, Cather Inc. has one of the most advanced lines of environmentally safe coatings available in the world today. These products are on the forefront of the legislatively driven environmental market, yet the technology has been field-proven in the aircraft industry for over eight years. The Company's products include not only traditional organic paint coatings, but also a new line of inorganic ceramic coatings that are unavailable from any other source. The Company is backed by Cather's technical staff that includes one of the top organic chemists in the nation and a former head of inorganic coating development for NASA. The Company's products are manufactured by Cather Inc. in Kearney and Red Cloud, Nebraska. Cather Inc. has a production line rental agreement for emergency capacity with one of its stockholders that owns another private paint company located in Decatur, Illinois. Cather Inc. has a production capacity approximately 11,000 gallons a day, with a short term additional capacity of 8,000 gallons a day between the two facilities, well beyond Cather's near term projected capacity. Cather plans a production plant in The Company's territory next year to serve East Coast OEM's and distributors. The Company plans to share facilities with Cather's warehouse and office in Petersburg, Virginia, and offer tinting and over-the-counter sales of paint and painting supplies to commercial painting contractors, as well. The Company will purchase a limited inventory of products for its exclusive use, but will have the advantage of being able to draw directly from Cather Regional stock to fill sales orders. In the initial stages, this will prevent The Company from having to purchase inventory far in advance of need, and limit the amount of up-front inventory investment. The Company's start-up expenses require only the purchase of two computers, a manual tint machine, small stock of tint base and tints, a fax machine, a sales counter and some display shelving and pegboards. The ongoing expenses will include rent of less than $500 monthly, plus utilities, telephone, and travel expenses. A detailed operating budget can be found in the Financial Projections and Assumptions. The Mission of The Company is the same as that of Cather Inc. - to capture significant sales of the growing environmentally driven coatings market through sales of products developed and field-proven for over eight years in Cather Inc. aircraft coating and covering business. Also, Cather Inc. offers new products such as coating and cleaning products that will enable removal of hazardous solvents and materials from the workplace. The Company and Cather Inc. are committed to leadership in environmentally friendly coatings and cleaners which offer end-users an alternative to dangerous products and procedures. Cather Inc.'s chemists seek to make available safe formulations at competitive prices to OEMs and other users. This will allow The Company to not only offer environmental compliance, but also significantly save the customer in production costs. The Company's principals and other representatives of Cather have found that most potential customers desire a complete environmentally safe process for cleaning and preparation, priming and final coating. For this reason, over the past year, Cather Inc. has invested in further development and expansion of its product lines to provide a complete line of products, which are described in detail in the appendix. Besides offering Cather's proven line of coatings, The Company now has a line of wood, metal and masonry primers and sealers, high technology ceramic coatings, metal primers and also enjoys the rights to private labeling of a line of waterbased non-solvent cleaners and paint removers. These products replace toxic and highly volatile solvents used in many industrial cleaning and degreasing products, such as tri-chloroethylene, acetone, MEK, toluene and xylene. Awareness of EPA and state agency regulations for the use of paint, coatings and cleaners for industry has enabled The Company to capitalize on the expanding market for environmentally friendly products created by this changing regulatory climate. EPA and state regulatory departments have proven to be excellent sources of user and enforcement information. In conferences with the EPA, officials have stated that future regulations will be strengthened if coatings, such as those sold by The Company, are more widely used. State interest is so high that the Commonwealth of Virginia regulators have invited Cather Inc. and The Company to speak to the Commonwealth's users about converting as an example to Virginians. Also, the EPA has invited Cather Inc. and representatives of The Company to a recent aerospace conference in Raleigh, North Carolina and encouraged making attenders aware of safe products available. In 1985, Cather Inc. developed its outstanding, high performance, environmentally safe line of polyurethane coatings, trademarked as Shine 2000. Since then, these technologically superior coatings have been field test-proven on aircraft around the world. Shine 2000 is now being introduced into broader aerospace, industrial, architectural and governmental markets. In 1991, as new, and more stringent regulations focused attention on the environmental coatings market, Shine 2000 captured the interest of both government regulators and industry. Cather Inc. recognized that it had the benefit of having a field-proven environmentally friendly coating capable of meeting foreseeable EPA regulations. Cather Inc. has made arrangements to acquire a significant advance in coatings technology through licensing. This technology will allow Cather Inc. and The Company the opportunity to offer customers the ability to spray a chemically bonded glass or ceramic on a surface at room temperature, using normal spray equipment. Such protection would be unparalleled in the industry. The Company feels that this ceramic line of products offers more potential than any other product it currently offers. This new ceramic coating is environmentally friendly. New markets are expected in shipping, oil, steel, architectural products, marine, automotive and aerospace. The Company will be at the forefront of Cather's expansion and is currently marketing products in Virginia, Maryland, Massachusetts and Rhode Island. The Company offers customers a full line of coatings for the high performance end of the coating market in both organic and inorganic coatings and cleaners. The Company brings to its customers market leadership in quality industrial and OEM oriented products which meet stringent environmental compliance standards and which provide substantial cost savings. The Company emphasizes and shows potential customers that they can remove all hazardous solvents from the work place while saving money. This insures customers of environmental compliance well below foreseeable Volatile Organic Compound (VOC) limits set by the federal government. Since 1990, the overall responsibility for implementing the Clean Air Act Amendments of 1990 rests with the EPA, which began a major effort to control VOC emissions. Title I of the act involves control of VOCs from paint products and surface coatings operations through the development of Control Technique Guidelines (CTG's). The CTG's are used by individual states to set emission limits. Companies across the country are now experiencing regulatory impacts and are actively seeking new technology from companies which provide safe environmental solutions. Recognizing that government regulations will become even more stringent in the future, The Company's line of Cather non-toxic water-based high performance urethanes, enamels, ceramic coatings, epoxy coatings, and aqueous cleaners eliminates the need for highly volatile solvents such as acetone and lacquer thinners. By removing the solvents from the workplace, this could mean a disposal cost savings of $400 per drum in rags and paint filters and a savings of $500 to $900 per drum in solvent waste and paint waste. It also can eliminate expensive solvent reclamation processes. Another example of substantial cost reduction is that while the products are competitively priced, the paints of Shine 2000, for example, obtain performance in 3/4 to 1 mil thickness compared to 2-4 mil thickness required by most paint systems currently in use. This high performance in thin coating also translates to an added benefit weight savings of 50% or greater for weight critical applications. The film that is deposited when a coating dries is the solids content of a paint. Thus the cost per gallon of solids is one of the two factors upon which cost can be realistically compared. Most Shine 2000 products are in the forty percent (40%) range in solids and can provide full performance in .75 to 1.0 mil in thickness. The general rule of thumb for coverage of paints is that two coats at twenty-five percent (25%) solids covers 200 square feet at a total 2 mils thickness, consuming a gallon. For this reason, a typical Shine 2000 product, being forty percent (40%) solids with 1 mil thickness, would give a coverage of 640 square feet from the same gallon can. Therefore, the Shine 2000 product can compete with lower performance products costing one third the amount. In many cases, such as that of enamels and urethanes, the products are priced competitively. In such cases, the three times coverage capability of the Shine 2000 product results in a two hundred percent (200%) cost savings on the paint alone. When environmental and cleanup cost are included, production cost reduction is significant. Cather Inc. quotes solids content by volume. Their competitors typically quote solids by weighty which is misleading. Most of the products offered for sale by The Company are single component products, thus any unused paint left in mixing cup or spray gun can be returned to its container, instead of being disposed of as is the case with the two component systems. However, the two part coating systems that are offered have been designed for a long shelf life to avoid applications problems. Users of Cather products have proven these situations reporting significant overall process savings due to the increase coverage with Cather coatings, decreased insurance costs and decreased clean-up and disposal costs. One window manufacturer in Nebraska, Fenetre has reportedly saved 200% on their coating costs alone, while further savings in fire related insurance, workman's compensation, and absenteeism are indirectly increasing the economics of their production of wood windows. The Company's Cather product offerings have gained recognition and respect for product quality and integrity such as Shine 2000. Fly-Right Inc. has been authorized to use Shine 2000 on its airliners. The Cather wood primers have received top performance ratings in independent testing by Littlefond Laboratories. Cather products have passed industry and military tests. Locally, the Company has sold Cather coatings to the Menyunk Company, Petersburg, Virginia, for use on its popular line of Rensselaer commercial doors. Cather products have been used on aircraft from commuter planes to jumbo jets for over eight years, proving the products excel in weather and pollution. In an example of direct testing competitors, Shine 2000 aliphatic polyurethane has out performed Elby's Blax in weatherometer tests (1000 hours 15% more glossy). For the past three years, one of the Company's principals, Eugene Won has been involved in much of the new applications work and new product applications testing, providing the needed knowledge to help customers solve problems. The Company's offering of Cather products does not use the hazardous VOC's of current solvent paints and its level of safer VOC's is lower for each type of product. The following is a listing of The Company's offering of Cather Inc. EPA compliant products. Shine 2000 is an ultra-high performance, water-based, aliphatic polyurethane for aircraft, railroad cars, exterior steel structures, marine and truck and automotive applications, that has been proven for over eight years in the field. Faux Shine is anew water based, environmentally safe paint, and is a high performance coating used for coating wood, metals and plastics, for both interior and exteriors surfaces. It is extremely cost effective and can compete favorably with quality outdoor paints. Cather Inc. offers both a single and two-part epoxy primer and concrete sealer for general metal and plastic priming applications, and industrial and warehouse concrete floor sealing. This primer was designed primarily for OEM applications for metals and plastics. Being single part, the primer can be used in complex paint distribution and circulating systems often found on high volume production lines, where two part epoxies would vastly complicate the spray application system. The product contains rust inhibitors and also provides a smooth finish for automotive, marine, and architectural applications. A water based epoxy wood primer specifically formulated for use on preservative treated woods, but which can be used on virtually any wood surface that requires a top quality cost effective primer. This is a room temperature cure ceramic coating that chemically bonds to the applied surface and provides a level of protection from corrosion heretofore only attainable by fired or plasma sprayed glasses and ceramics. The product can be used as a primer or coating. This product line is potentially Cather Inc.'s largest and was developed originally for space and aircraft applications. It is expected to replace conventional primers for bridges, dumpsters, storage tanks, automotive, marine, metal windows, electrical insulation and many other applications. These products are variations of clear Shine 2000 or acrylic enamel. When applied and allowed to dry, it fills the wood grain and is easily sanded. These cleaners were formulated by Cather Inc. to solve coatings failure problems on plastics and composites caused by residual mold release and other contaminants resulting from manufacturing and handling. A new aluminum cleaner and preparation that provides a significant labor savings over traditional metal preparation processes, while retaining excellent corrosion and adhesion performance. This new water-based cleaner is designed to replace old solvent cleaners in "hot tanks" for degreasing and stripping metal parts while repairing or rebuilding automotive, marine and machinery. This is an FDA approved cleaner series for general cleaning and degreasing of metals and plastics. A new innovation for the marine field, the Shine 2000 Teak and Mahogany Finishing Kit provides the protection of high performance paints previously unavailable in non-toxic form to the yachting market. This kit is a combination of Cather Inc.'s aluminum cleaner and a selected color Shine 2000 to paint the aluminum spars and masts of boats. This kit offers the first long-lasting flexible finish for inflatable boats and jet skis. The Company is fortunate in that its offerings to customers are in a market that is currently driven to change by regulation. Regulations requiring lower VOC emissions, particularly for hazardous air products (HAPs) are continuing to spur interest, causing industries to watch the federal standards more closely. The EPA has been preparing and releasing new Control Technology Guidelines (CTGs) to the states as regulatory level guidelines for over ten industries. These include aerospace, metal coatings, wood finishing and others. Industry is aware of the impending demise of normal solvents and is turning to non-hazardous, solvent-free and high-density coating formulations as alternatives to solvent-based systems. Paints and coatings in the United States are a $12 billion per year industry with worldwide sales of $30.5 billion per year. The U.S. government buys directly some $1.2 billion in paint products each year, and is the largest user of polyurethanes, in the country. Paint is one of the most widely used products in the world. Almost every manufactured product is coated in some fashion to protect it against weather and the ravages of use. The marine coating industry is large, with markets in commercial shipping, oil tankers, yachts and worldwide fishing fleets. Over 750 million gallons of marine coatings are sold in the U.S. alone. Additionally, the total worldwide market for ceramic primer coatings to repair blistered and delaminated yachts is estimated by Catherine, to be $55 billion alone. One of the Company's principals, Eugene Won, has been a major contributor to researching and establishing Cather's offerings for the marine market. In the aircraft industry, the after-market marine industry and the general industrial sector, the requirements for high-performance coating products is measured in the millions of gallons per year. A spokesman for the Saxon Paint Company said that in 1992, the California marine market sales for linear polyurethane coatings was $5 million. They know current approaches by other manufacturers do not offer long-term EPA compliance, and many are responding to reductions in VOC to avoid fees and fines. They foresee the cost savings from greater coverage, less disposal cost and a better work environment. They have the experienced staff and, in most cases, the equipment needed to apply Cather Inc.'s products, therefore, their up-front investment is minimal. Large potential customers normally take three to eight months to begin to order. This is because they need to test the products, perform cost analysis, purchase or modify production line equipment and do a pilot run on their production line prior to full production. However, because of the inertia, they tend to enter into longer term contracts to optimize cost. The Company is also working with small users (50-300 gallons per month) that are generally capable of faster reaction. The Northeastern, Mid-Atlantic and Midwestern regions of the U.S. have a high concentration of these smaller companies, where in many cases the owner is directly involved in the decision. The Company has over twenty-five small firms that are actively marketing or in the process of evaluating Cather Inc.'s products. A balance of small and large company users will enhance The Company's growth and smooth its cash flow needs. Cather Inc. has a nationwide computer marketing database of its sales leads and customers. The Company has a file in the national database, and can communicate with Cather on all sales matters through this excellent marketing program. 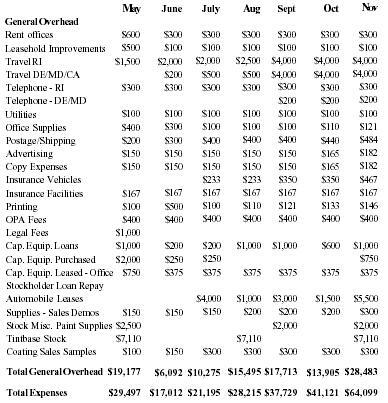 A database sample was used to generate the financial projections contained herein. A review of this database provides a current overview of The Company's many market contracts and progress through testing, sample orders and application. The financial section of this document provides a summary of the amount of business represented by current contacts. Most of the approximately 50 contacts represent part-time work of the principals while conducting their respective responsibilities with Cather Inc. These responsibilities involve penetrating large accounts, opening other distributorships and working with sales representatives in Massachusetts, Virginia, Maryland, Rhode Island and Delaware over the past 5 months. This is a good indication of the interest being generated in The Company's offerings by a wide variety of industries and sizes of manufacturers, while expending approximately one man month of work. Sholz Aviation has painted an L-1011 Jumbo Jet in the Mojave Desert. Griffin Air has permission from the Fly-Right Inc. to paint their airliners with Shine 2000. McKinley Airlines has 3,400 employees in their refurbishment center in San Jose and must environmentally conform to state regulations or close. They are being watched closely by state regulators. McKinley officials are monitoring Cather Inc.'s work with Griffin Air very closely. Cather is in discussions with representatives, manufacturers and distributors in the petroleum industry in various parts of the world. Private labeling for other companies is also a large, potential sales market for The Company. The Company is in discussion with potential private label customers in the automotive market. The Company expects to introduce a one-time permanent tire coating to these potential clients that would eliminate current cleaners and silicone coatings for tires and bumpers. Shipments of paints and coatings will increase over the current $12 million market in response to growth in construction, motor vehicles and consumer hard goods. Pricing will remain highly competitive throughout the 90s. Demand for paints and coatings is strongly cyclical in nature and depends directly on activity in the housing/construction, automobile, aerospace and household appliance sectors. Higher than average growth is expected for the non-solvent delivery systems including powder coatings, high solids and radiation-cured formulas. Wall coverings for housing will gain ground at the expense of architectural coatings. Consolidation of the domestic industry will gradually turn to repositioning as firms mobilize resources to compete in the technology-driven markets. (Source: National Outlook on Industry -Industrial and Agricultural Chemicals). There is a wide variety of hazardous solvent based protective coatings available in today's market. However, most will eventually disappear from the market as the EPA will phase them out over the next several years, primarily because of hazardous product content rather than VOC level. During this period of great transition to safer coatings, Shine 2000 products can establish and maintain a fair market share. The Company and Cather Inc. expect to establish a leadership role in the ceramics coating field because of the amount of technology Cather owns in this field. The Company, believes it is a year or more ahead of its competition, such as Elby, with Shine 2000 urethane. The Company will be well protected against competition through Cather Inc.'s patent licenses and trade secrets for products. Cather Inc. is also completing development of a new state of the art urethane coating that will even outperform Shine 2000 Aliphatic Polyurethane. This new technology could place The Company as much as five years ahead of its competition selling Elby and Iddings-Larson. The reason for Cather projects lead is that the development cycle time is long in such large bureaucratic firms. The competition for The Company's offerings in paint and primer products would come principally from major paint manufacturers such as Elby, U.S. Paint, Iddings-Larson, Re-Grape, and Oasis. Most of these large firms have focused their efforts not on water-based technology, but on lowering the VOC's emitted from use of their existing solvent based paints. They have not endeavored to change the VOC to environmentally friendlier substances as was done in Shine 2000. As a result, their water-based programs have taken a backseat. Therefore, even though these firms have well developed representation and distribution networks, they cannot compete in performance, environmental compliance and cost effectiveness. Attempts by other manufacturers to develop water-based paints have not succeeded in producing a product that achieves the same high-level of performance as the highly-toxic, two-component, solvent-base, catalyzed systems. The Company's Shine 2000 product provides a coating surface that has the same general chemical makeup as these solvent paints and, hence, equal or superior performance to those of two component systems, without the toxicity. This technology allows Cather to maximize water in its formulations versus the amount of industrial cleaner, while dispersing higher levels of solids than competitors can achieve. Thus, The Company can offer the best currently available product. Some of the manufacturers of toxic marine polyurethane's are beginning to advertise their coatings as five to ten year finishes on marine teak and mahogany. They have introduced their products in small containers for do-it-yourself boaters. The competitive finishes contain highly toxic isocyanates, that have generally only been sold to professionals with proper safety equipment. With increasing regulation and growing public awareness of toxic substances, The Company expects public use of these toxic products to be very short lived. Shine 2000 will give performance equal to or exceeding the toxic coatings, however, Shine 2000 is safe. It has the additional advantage of being flexible and is capable of expanding with the wood in the marine environment. Marine dealers and distributors have shown great interest in the non-toxic aspect of The Company's offerings, as many have had problems with personnel being sensitized to the toxins in the products they have used for many years. Bois Tec was formulated in response to a need in the wood window and door industry for a product that would adhere well to woods freshly treated with the newer EPA approved preservatives. The manufacturers currently using it were unable to find an acceptable substitute on the market. In addition, the primer achieves excellent performance when used in conjunction with Shine 2000 or the new Acrylic Enamel Faux Shine. The Company expects to follow the manufacturer's lead in developing wood window and shutter manufacturers as clients. For years industry has had available coatings that are made of organic resins, but contain ceramic particles. These coatings have many of the benefits of ceramics, but do not have the qualities of pure ceramic (silicate or glass) coatings that can be expensively sprayed with a plasma torch or created in a kiln, because the resin binder creates limitations inherent to organics in sealing, U.V. protection and water permeation. Later, ceramics coating were developed with heavy metals as filters. These coatings will suffer the fate of the heavy metals they contain with EPA regulations. Cather Inc. has second generation ceramic coating technology without heavy metals and has about three years of experience in this product for marine, concrete coating, truck, swimming pool, and dumpster applications. However, Cather Inc. has now completed licensing of a significantly broader patent and trade secret coverage of ceramic coating technologies including a new third generation coating. The Company will assist with applications work for the new generation and in introducing the new products to customers. Cather Inc. is actively pursuing this advanced ceramic coating. The new third generation coatings chemically bond a silicate (ceramic) coating, both with and without fillers, at room temperature on a surface. This is monumental in that concrete structures, bridges, metal architectural components, trash dumpsters, oil field equipment, sewage treatment plants and many other applications can now have a chemically bonded layer of glass, the ultimate protective coating with normal applications processes. The Company knows of no competition for this product. The Company has received significant interest in its offering of cleaner products, particularly from OEM manufacturers and marine service companies. The conversion to non-solvent waterbased cleaners is a relatively new industry. Cather Inc. has a private label of one of the finest products produced in this new area and our manufacturer is not competing in our markets. Thus, The Company has an excellent opportunity to capitalize on the elimination of cleaning solvents as driven by the EPA. Shine 2000 Harbor Wood Eastings has no real competition offering the same level of performance and environmental friendliness. Competitive products are highly toxic and will probably be regulated off the market in future years. Shine 2000 Inflatable Boat coatings have no known competition. Current rubber paints seldom last for more than a season and most dealers refuse to sell them. MacNaughton, in Rhode Island, which normally discounts marine paint by 50% from retail, is selling the inflatable coating and Cardinal cleaner line at retail, because they have no known competition. The Company is currently in testing with Sisson, the largest manufacturer of Inflatable Boats, to solve their surface deterioration problems by coating with Shine 2000. Shine 2000 provides its users with enormous advantages over currently available products. Not only does Shine 2000 perform to the same high standards as two component catalyzed systems, it does so with low VOC's without the release of toxic isocyanates and without creating hazardous waste. Its performance is proven and excellent. Testing in independent sources has revealed that Shine 2000 retains its gloss longer than Elby's Blax, a toxic isocyanate based paint by over fifteen percent (15%). Manufacturers using Shine 2000 can lower their insurance costs for both plant and personnel because the product is non-toxic and non-flammable. Any unused paint left in a pail or spray can be returned to the container, instead of disposed (as hazardous waste) as is the case with two component systems. The shelf life of Shine 2000 is seven years without the premixed hardener, and several years with hardener, to accelerate time to maximum hardness. It also can withstand several freezing cycles. The Company's products are competitive. Tite, a U.S. Paint two-component system, is sold to marine dealers for approximately $90 per gallon and to manufacturers, who use large quantities, for 20% less. Elby's reduced VOC version of their well-known Blax line is being sold to marine dealers in California for about $110 per gallon. Shine 2000 performs at least as well as Tite and Blax and costs approximately $100 per gallon to the dealer. It provides about 50% greater coverage per gallon as competitive coatings. This results in less cost per square foot of applied surface, even before insurance economies and hazardous waste costs are taken into consideration. The Company's wood primer was formulated by Cather in response to a need in the wood window and door industry for a product that would adhere to freshly treated woods in a production environment. Fenetre Windows, a window manufacturer which switched to the Cather wood primer costing about three times as much as the ineffective primer they were using. Yet, they reported a savings of 200% on process costs by using Cather Inc.'s product. This was a result of increased coverage and decreased environmentally associated disposal costs. The Company's offerings of Cather products compete at the high technology, high-performance end of the coatings market. There is less competition in the high-performance end of the market, and users are willing to pay for the performance. Cather Inc. is working to establish its products as the EPA's "best available technology" in several markets to increase the pressure of regulations. This will even further maximize The Company's ability to penetrate markets. Cather Inc. has been working with the Fly Right Company to specify paint for several applications for their aircraft and facilities, and has been shipping initial orders. As a result, Fly-Right granted Griffin Air a waiver to paint their 737 aircraft. Catherine, recently introduced Shine 2000 to McKinley Airlines at its maintenance center in San Jose. Since they are fighting closure by state regulators, McKinley expressed an interest in closely following Griffin Air's efforts in testing the product. Airproof, in their large airliner refurbishing center in Carmel, CA., has painted an L-1011 airplane under their own specifications and have tested Shine 2000 for aircraft interiors. There are several aircraft refurbishment centers and manufacturing plants on the East Coast, and The Company has or intends to open conversation with such companies as Stark, Yamhill-jet, Morrison Aviation, VAJCO and several others. Shine 2000 has also undergone preliminary testing by the U.S. Navy for naval aircraft applications. The product passes all tests needed for MIL - STD - 85285 as run by potential customers and the Navy's NAWC lab. Cather Inc. must still workout tint formulations with its tint supplier prior to final submission for Mil-Spec Qualified Parts List approval. The Army has an open program to encourage similar testing which Cather Inc. will pursue for tanks and army aircraft in the future, with a chemical resistant version of Shine 2000. A portion of the military market for the company's products is within the scope of the company's intended sales goals. The company expects to visit such facilities as the Point Woods Marine Overhaul Facility, the Hagerstown Shipyards, the Naval Supply Center in Massachusetts and many others. Cather Inc. is working with OEM's such as BelMont (electrical power systems components), Menyunk Company (metal, residential and commercial doors), Vollum Buses, Rhyne Door (metal cellar doors) and many others to test Shine 2000, ceramics, primer and cleaning products to remove hazardous products from their workplace. The Company has supported many of these efforts and similarly is interested in removing hazardous solvents and other products for its potential clients. The Company normally: coats the potential customer's product for laboratory testing; supplies small samples of products for direct use by customer laboratory and production staffs; accepts an order for product for a small scale production trial; and then, assists the customer in full production change over. The oil industry is a major user of paint for storage facilities, field equipment, offshore platforms and refineries. It is expected that this will be the most rapid growth producer for Cather Inc. Cather has been working to have Shine 2000 and ceramic primer specified for storage tanks in Maryland and Delaware. The Company has introduced the Cather ceramic coating products to municipal sewage engineers near Pensacola, Florida to begin entry into this market. Industrial paint contractors along the Gulf Coast also offer a large potential market for The Company. Cather Inc. has been selling wood primer into the window market for the past year and has recently successfully completed independent testing to broaden the market introduction. Cather Inc. now expects to significantly increase its market penetration for priming preservative wood. Orders from larger wood window manufacturers can be tens of thousands of gallons per month. The Company intends to support this effort and cover several potential East Coast clients, starting with Jascoek corporation. Reiser Laboratories, located in North Carolina, is one of the leading producers of wood preservatives for the window industry. Reiser has opened discussions for potential private labeling of Shine 2000 wood primer for their wood window manufacturing market. A joint marketing trip is scheduled to visit Eliot Windows, Steinberge Windows, and Knudsen Windows (a potential client for The Company). These accounts could mean as much as twenty to forty thousand gallons of wood primer per month. States and cities are potentially large users for Shine 2000 for such applications as vehicles, architectural repair and construction, anti-graffiti coatings for street signs and buildings, clear coatings of buildings for acid rain protection, railings and guardrails, pipes, storage tanks, heating and cooling equipment, fireplugs, etc. This is a significant market and Cather Inc. made excellent progress in initially penetrating the city of Newport. Cather Inc. plans to immediately pursue the cities of Hagerstown, Blacksburg, Silver Springs, San Jose, Dover, as well as the state of Rhode Island. The Company has been handling the interface with the Rhode Island, and plans to penetrate the Maine and New Hampshire markets during the summer of 1994. The Rhode Island Department of Air Quality, has requested that The Company participate in a Cather special presentation to paint using government departments. The users will be urged to switch to environmentally safe products to set an example for Rhode Island industries. Rhode Island recently informed Cather Inc. that it has applied for an EPA grant to demonstrate VOC reductions, and would like to involve Cather Inc.'s products in actual usage demonstrations. The Company will be the official interface and sales agent for this work. Cather Inc. has two representatives on the East Coast and two in California that are starting sales for inflatable boats and marines wood finishing. Cather Inc. staff has attended major boat shows on both coasts to survey OEM and distributor reaction to the products. After establishment of the first two products, the linear polyurethane and ceramic yacht market will then be pursued. Cather Inc. intends to establish itself principally in aircraft, metal manufacturing and municipal markets until the expected cash flow can support full expansion into additional markets. Cather Inc. will then focus on other general OEM product coating, marine, architectural, petroleum and automotive markets. U.S. Government marketing will also be expanded in the future to include not only the Department of Defense, but also, Energy, Transportation, and other departments. The U.S. government is the largest paint consumer in the U.S. Most of The Company's marketing efforts will be with OEM manufacturers. For this reason, neither Cather Inc. nor The Company will require expenditure of precious capital in national or regional advertising programs to reach the general public. Whatever promotional efforts The Company may employ will be shared with Cather Inc. and distributors. Cather Inc. will selectively advertise in specific market trade publications and participate in trade shows. The Company will only be required to pick up its own expenses to attend these trade shows. Press releases and product information bulletins will be sent to trade publications by Cather on behalf of all of its representatives. Most industrial and service users are heavily dependent on these trade journals to keep current, and The Company and Cather Inc. believes them to be the best initial source of advertising and the least expensive. The Company is currently using industrial directories to search for customers as well as receiving leads from Cather from the national marketing database. The Company intends to purchase industrial directories on computer disk, as they are now available with built-in search functions to allow the user to quantify the exact parameters he wishes for a potential client and then scan the database for contacts. As the Company acquires additional representatives, they will be selected on criteria that includes current industrial sales background and a base of industrial contacts that forms an immediate "warm market" for The Company's products. This approach has proven to shorten the training period and produce faster results. The Company will start operations with two sales employees at present, Matthew Fischer and Eugene Won. Mr. Fischer, upon formation of The Company's corporate shell, will leave his current position as Atlantic Region Sales Manager for Cather Inc. Mr. Won is currently the East Coast Applications Demonstration Representative, and a part-time sales representative, for Cather, and will similarly join The Company on a full time basis. The ground work the principals have performed through their activities in opening the East Coast market for Cather products has resulted in a substantial number of leads to be followed up on The Company's behalf. These not only include major OEM's, but also a large number of smaller industrial users that require local servicing and can make decisions quickly. The Company will continue to pursue the larger industries as the factory's representative, but will also begin to serve the smaller firms, on a direct basis. The cash flow generated by commissions on the large firms will build a cash base to allow for future expansion. The Company plans to hire additional staff to cover the Rhode Island, New Hampshire and Delaware markets, as well as opening up to two additional stores by the end of the first year. Matthew Fischer has spearheaded the opening of the Atlantic Region for Cather products. In his capacity as Sales Manager, his efforts have resulted in sales to such prestigious firms as the Johnson Institute and Menyunk Company, currently the largest East Coast user of Cather coatings with anticipated monthly usage topping 3,000 gallons per month within the year. Eugene Won has been involved in development, applications testing, and pilot marketing of environmentally safe inorganic ceramic coatings in the marine industry for the past three years. He assisted in Cather's acquisition of the latest in ceramics coating technology. He had been trained by the Cather applications engineering staff in special techniques necessary for application of water-dispersed products and application of ceramic coatings, using both conventional and electrostatic spray equipment. He assisted in a major test marketing of marine ceramic coatings in Rhode Island, Florida, Delaware and New Hampshire, including performing critical initial market introductions for over 500 miles of Eastern Coastline. Mr. Won has been successful in establishing several customers as a sales representative for Cather Inc. and has several major customers pending, such as Patterns Transportation, Exposition Leasing, and Traditional Container Lines. He is continuing his education as an evening business student in a local college. Mr. Won will also provide part-time applications training and assistance for Cather Inc. as the senior East Coast applications expert. Mr. Fischer brings 25 years of sales and management experience to The Company, 22 of which were spent in commercial/industrial sales. While still in college, Mr. Fischer accepted a full-time sales position with P. Chan Products and quickly became a top producer in the highly competitive business machine industry. Upon his graduation from the University of Virginia, he accepted a promotion to Sales Trainer and was transferred to the Canadian office of P. Chan. He was then offered a position as a major accounts representative with Alberts and Kehki Business Machines which provided an opportunity to develop strong relationships with some of Canada's largest companies. In 1972, Mr. Fischer opened Mercredi Business Systems with an associate. Starting with two employees, the company grew to an enterprise consisting of twenty persons and grossing $1.2 million per year. In addition to management responsibilities, he maintained his own base of accounts. Hundreds of small businesses came to depend upon Mercredi for their copiers and fax machines, as did larger corporations such as Canadian National Railways, Canadian Gas Association, Bagdad Hydroelectric Co-Op, Bank of Guelph, and the Ripe Tomato Restaurants. In 1987, Mr. Fischer sold his interests in Canada. He moved to Petersburg, Virginia where he managed Moore Systems, Inc. In just one year, he increased the company's sales volume by 250%, dominating the local market. When Moore Systems was sold, Mr. Fischer became a local distributor for an Iowa based manufacturer of industrial asphalt, roof, and concrete coatings. Mr. Fishcer received his B.A. degree in Marketing from The University of Virginia. Eugene Won was trained in ceramics and environmentally safe water dispersed paint application and has performed applications demonstrations and training in these areas for the past three years. He has worked in OEM manufacturing and the marine pleasure boat markets. He has demonstrated coating and preparation from local boat yards to the Wright Yacht factory and at all of Cather's East Coast OEM sales efforts to date. His technical expertise and enthusiasm make him a valuable asset to The Company. Mr. Won has been enrolled in business and computer studies on an evening basis at a local college. Mr. Won was the founder and President of a ceramics company. Mr. Won devoted over two years in the development, market research and testing of state of the art ceramic coating products and complete systems of repair for the marine and industrial markets. He was instrumental in the introduction of ceramic products to Cather and has headed the effort to introduce the product line. He has also headed the efforts to introduce Shine 2000 and other Cather products in the eastern United States and foreign countries. He was the founder of Won Aviation Corporation, a successful aerospace consulting firm that specialized in assisting high technology companies in creating new divisions and entering new areas of business. For twelve years, his consulting work included all aspects of U.S. Congressional liaison, finance, operations, marketing, distribution and manufacturing. His aerospace work included all aspects of finance, operations, marketing, distribution, licensing joint venturing and manufacturing. His clients have included Vagner Signal, Grenier, Ozman, Dynamics, Wilhelm Systems, Voila, Rech Corporation, Williams Corporation, and others. Mr. Won also co-founded the Gaull Bay Company, a marketing and engineering consulting company involved in upper level corporate market consulting and the design of weapons guidance systems and simulators for missile applications. He also served as Vice President for Operations for Fieldman Corporation, a high volume consumer electronics manufacturer, where his experience included engineering, manufacturing, advertising, national distribution and dealer marketing. He served as President of Lambda Technology, an industrial product research and development firm. Mr. Won holds a BSE-EE from the University of Massachusetts with selected post graduate course work. He holds the patent for radar velocity measurement for small projectiles. Ms. Sutcliffe was one of the founders and former President of The Cather Aircraft Supply, Inc. Cather Inc. is the world-wide sole source for the Brun process for recovering fabric covered production and antique aircraft. It is also a manufacturer of dopes and coatings for this process. She was responsible for the start of the Shine 2000 product line. Ms. Sutcliffe developed the performance specifications for Shine 2000 products and performed the development testing of the products in conjunction with Holly White, the original manufacturer. She initially obtained for Cather Inc. the worldwide marketing rights to the products, she performed the initial additive development testing program, and recently negotiated the manufacturing rights and set up production for Shine 2000 in Cather Inc.'s Hagerstown facility, together with Holly White. Ms. Sutcliffe performed the applications engineering for the Shine 2000 products for 8 years, becoming one of the leading experts in applications techniques for waterborne coatings. She established dealers for Shine 2000 and other aviation products produced by Cather Inc. Ms. Sutcliffe was later instrumental in joining her paint technology with Mr. Terry Won's ceramic technology and founding Cather Inc., with her two brothers, Geoffrey and Christopher Sutcliffe. Prior to founding Cather Inc., Ms. Sutcliffe owned and managed Murfin Lumber Company, a lumber and building supply retailer in Kearney, Nebraska. She also spent several years as a technical and sales representative for hardware and industrial products. She has been a licensed pilot for over 25 years and is one of the country's experts in recovering and restoring antique aircraft. Ms. Sutcliffe graduated from the University of Kansas in 1965. Provide maximum growth for The Company & Cather. Select the most profitable customers while competition between representatives is low. Take advantage of the products most environmentally in demand. Optimize travel within a region. Selectively offer franchises and dealerships to companies or individuals who have the market position, personnel and capital to service specific markets and move substantial quantities of The Company's products. An example is franchising automotive specialty product distribution. Initially, The Company expects little or no competition in its paint offerings, because of the technological advantage of the Cather products. The Company expects to maintain a leadership role for the envisioned future with its ceramic coatings offerings because Cather products in this area are well protected. Thus, an emphasis will be placed on ceramic customers after competition surfaces for the paint line. The Company will receive distributor pricing, plus a 10% commission on sales for all products sold off the normal OEM pricing schedule to major users (200 gallons per month or more). Very large OEM quantities are usually negotiated and The Company will work out pricing and compensation with the factory in those cases on a direct ship basis. However, generally Cather intends to provide the stocking function for the area of operation of The Company. A small stock will be employed initially, then the company will build larger inventories as cashflow permits. In the second, and successive years of operation, The Company plans to open industrial paint outlets (stores) in the major cities within the assigned Sales Territory. The Company's earnings will be re-invested to this aim for the first two years to self-finance the opening of outlets and gain associated hard assets. However, a block of common stock shall be reserved for future capital expansion requirements if market growth requires. The potential is high for adding significant long-term future assets, if the stores capture even a small percentage of the commercial-industrial contract painting market. The Company needs to have excellent computer resources to communicate with Cather, company sales force and distribution outlets. The Company plans to use a network to include use of notebook computers and new mobile data networks to keep in communications, even in customers' facilities. The Company intends to maximize use to management tools to insure control while allowing for the delegation of authority needed to expand rapidly. Messieurs Fischer and Won plan to travel approximately three to four days a week for the first one to two years, establishing accounts, opening additional stores and supervising sales representatives. The Company will initially employ part-time bookkeeping and clerical staff. Expansion will occur first in the hiring of additional sales reps and a person to man the Petersburg store. When the Petersburg outlet begins turning a steady profit, second and successive stores will be opened. Expansion of stores will be initially planned to cover the major metropolitan areas in the territory. Then, expansion to fill in voids will begin. The Company expects to have between 12 to 15 outlets within three years. The Company's principals are expecting approximately $4.4 million in sales from representation from current and pending customers over the next year. 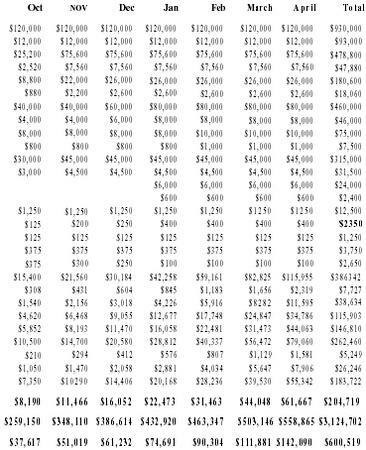 This represents $440,000 in income in a low overhead operation much of which can be reinvested in business development. The Company projects that with a $50,000 loan (projected to be repaid within the first year), an additional $1.7 million in sales can be realized. 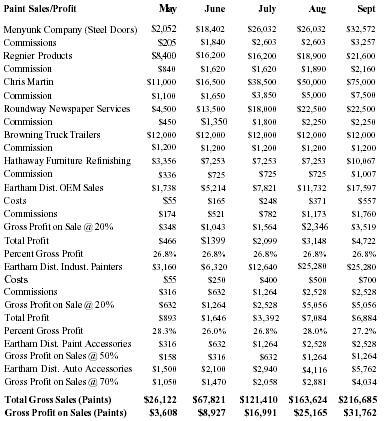 These sales would produce an additional $658,000 in gross income through adding distribution to the business. The Company's financial projections, at the end of this section, predict that the company can establish several additional manufacturer's representatives and an automotive representative as employees while establishing three distributorship outlets. The projected cash on hand at the end of the year is approximately $480,000. This is sufficient cash to reward employees with an excellent incentive bonus and establish new outlets to add additional equity for The Company's owners. By the end of the second year, cash available is projected to be sufficient to include passing income to the owners through the sub-chapter S, while still maintaining a healthy program in establishing new distribution outlets. The Company has been careful to establish the credibility and marketability of its products in the field over the past several months. This was accomplished with management's computer database control of a limited market introduction of The Company's products, so that accurate projection could be made of the marketing needed to expand current markets. The Company's manufacturers representative portion of the projections are based upon accounts that the company has obtained or are pending with very high probability. The Company's projections are based only on those accounts that are of this high probability status. Thus, all new accounts are excluded from the projections! Yet, the potential income is significant working only a small portion of The Company's leads. Despite the conservative projections, sales have been relatively easy because of lack of competition in high performance environmental products and an interesting and beneficial dichotomy exists when considering product and technological credibility. The Company has a well established technology from Cather products that have been marketed worldwide for over eight years in the general and business aviation market. The products are tested and The Company's salesmen often make direct references to aircraft that have sustained weather and aging for over eight years in the field, while still retaining an excellent finish. Not many consumer, commercial or industrial product companies can introduce a new technology into an environmentally driven market, and show eight years of successful use around the world. A sample of The Company's marketing database example printout is available upon request. The Company utilizes the Market Ease marketing program to manage its sales in conformance with all Cather distributors. The current database contains approximately 50 contacts. These contacts were made by Messrs. Fischer and Won in the course of searching out market opportunities and researching the applications for Cather products during the start-up phase of Cather's East Coast marketing expansion. Many were called on due to their proximity to major users who were being solicited to adopt Cather products, but were not immediately pursued due to the factory's emphasis being placed on larger firms. The majority of these contacts have been made in the past five months. The efforts necessary to produce the 50 contacts represents about one month of work by Messrs. Fischer & Won. It represents a factored projected probability of sales of $26,122 next month, with following months projected at $67,821, $138,860, $201,174, $328,235 and $486,749 if pursued. Thus, an excellent potential for distributor sales awaits exploitation. Further, the industrial painting market to painting contractors is very large. All but the largest industrial/commercial painting firms buy from distributors on a per job basis as they cannot enter into yearly purchase agreements. Even a minor dent in the toxic industrial paint business of industrial paint contractors, done by Iddings-Larson and Deries stores, would constitute major business for The Company. The Company has prepared a one year income, budget and cash flow projection that is included at the end of this section. Subsequently, the company has used this data to enter assumptions data into a modified financial package from Sutfield Tools For Sales, Inc., of Ventura, California to produce 5-year projections. The integrated financial program used generates what is normally a six spreadsheet projection in one integrated template. Although interesting in its projection of the great potential of The Company, they offer no definitive data beyond what can be forecast for the first year and therefore are not included. As mentioned above, the current or imminently pending accounts are forecast with assumptions on growth of the distributor outlet sales grouped by market. 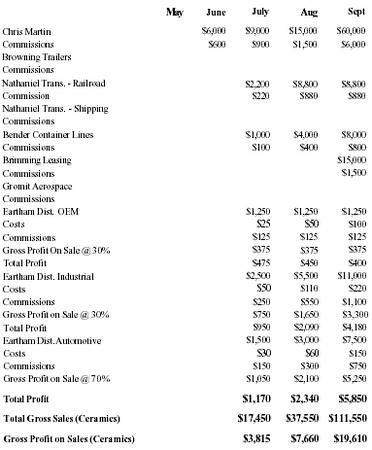 The first table provides the income projection for paint sales and the second provides projected sales for ceramic coatings. 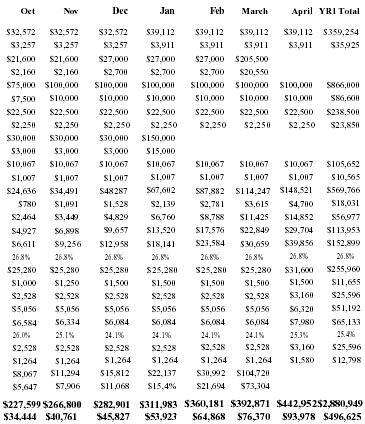 A summary of these income projections is included on the third. The budget for G&A and sales staff is included on the fourth table. 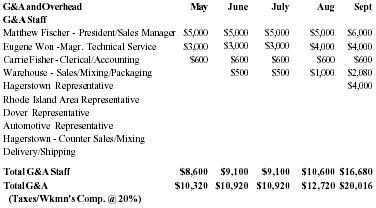 Note that salaries are kept low until cash flow permits an increase to moderate levels. Additional compensation will be granted by the corporate board based upon profit of The Company. Further commensurate with cash flow, representatives are shown added for Baltimore, Washington D.C., Wilmington, and an "at large" automotive representative. No large OEM sales are forecast for these personnel in the first year, other than their contribution to distributor sales to further make the projection conservative. The overhead budget is included on the fifth table. Rent for the Petersburg office is shared with Cather for their regional office. An office warehouse space has been located that is suitable in a central location, with excellent access to the freeway. A healthy travel budget has been provided to cover the cost of selling and servicing the customers. It is anticipated the initial office, printing and advertising expenses will be higher in the first months with start-up of the distributorship. It is assumed that large equipment will be purchased on loans and that automobiles will be leased, supplied to sales personnel because of the expected travel. A basic stock of tint base and cleaners will be purchased in the first month as well as supplies of painting accessories such as brushes and sandpaper for contractors. Approximately $12,500 of the first months capital requirement will go into inventory and capital assets. The sixth of the projections summarizes before tax income and cash flow. The projections show that a $50,000 loan would meet projected capital needs with about a25% buffer. 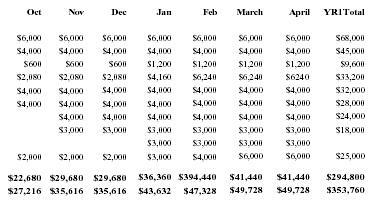 Breaking even on cash flow is projected about the end of the third month, and payback of the $50,000 loan is projected in the eighth month. 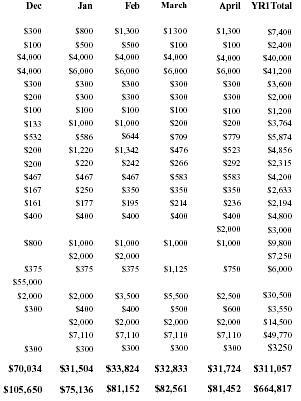 Within one year, monthly profit before taxes is projected to surpass $150,000 per month. The projected cash position at the end of the year shows a significant potential to invest in growth and assets to avoid taxes. The Company can quickly become very marketable to industrial conglomerates, kept as a cash generator or could enter the public market with its stock. The Company plans to operate as a Sub-Chapter "S" company, incorporated in the State of Maryland. The lower corporate tax rates, and proximity to major potential industrial users makes this an attractive location for The Company's long-term plans. Should it become possible, in the future, to expand The Company's assigned sales territory with Cather, a Maryland office could service the heavily industrialized areas of Maryland and Rhode Island. Near term, The Company can capitalize on this market area by selling franchises and setting up commercial paint dealerships, in addition to its direct marketing efforts. The value of The Company's representation/distributorship account base, and the cash flow it will generate, plus the ability to offer franchises, are the long-term assets of The Company. Much of The Company's earnings are likely to be invested in establishing industrial paint outlets in the major cities within The Company's assigned sales territory.